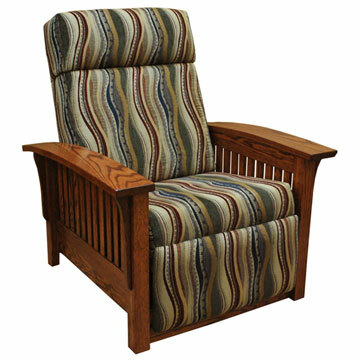 This Amish Mission Recliner Chair boasts an unparalleled level of craftsmanship in handmade furniture. Constructed by skilled Amish craftsmen using plain cut red oak (shown), you can take pride in owning furniture built to the highest standards with the strictest attention to detail and unparalleled craftsmanship. This exceptionally durable recliner features a sealed conversion varnish that protects this elegant piece from water, oil, alcohol and even nail polish. On top of all that, the ergonomically designed furniture is hand sanded and smooth to the touch. This furniture also features full Mortise & Tennon construction in which the joint of solid wood pieces are fitted together like a puzzle and glued together offering superior strength and durability. Other features of this extremely comfortable chair includes a high back for full shoulder and back support, as well as ball bearing mechanism to ensure smooth movement in any direction. These features give this furniture not only a refined look but a prestigious feel as well. Available in a variety of woods, finishes, fabrics and leathers.